Play Fortnite: Battle Royale on a PC, Mac, PS4, Xbox One, iPhone, or iPad. When experiencing most game play modes offered by Fortnite: Battle Royale, you'll participate in a match against up to 99 other players in real-time. Each match lasts about 15 minutes. The final portion of a match – referred to as the "End Game" or "Final Circle" – takes place when only a small group of soldiers remain alive, and the area of the island map that's still inhabitable has become very small. The goal is to become the last soldier alive. For this to happen, all others must be eliminated. 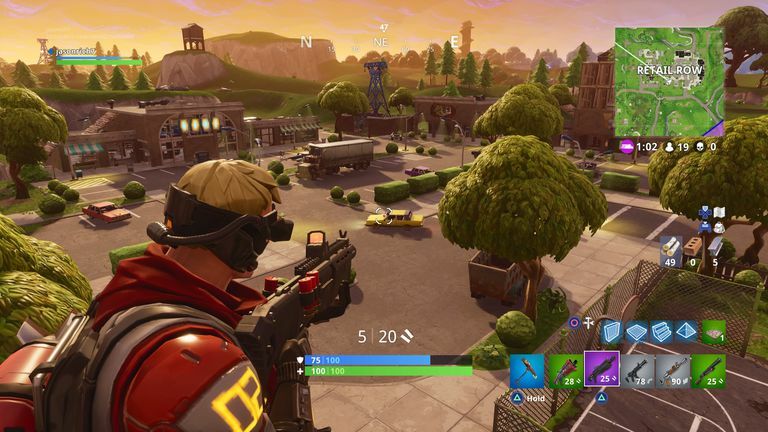 During the End Game portion of a Fortnite: Battle Royale match, only a few enemy soldiers remain alive. Fortnite: Battle Royale from Epic Games is currently one of the most popular games in the world. You can play it, for free, on any Internet-connected Windows PC, Mac, Playstation 4, Xbox One, iPhone, or iPad. It'll also soon be available for Android-based mobile devices. There's also a Nintendo Switch edition rumored to be in the works. You're about to discover 10 tips that'll help you stay alive during the End Game of a Fortnite: Battle Royale match. Throughout any match, it's a common strategy to collect a massive amount of resources (woods, stone, and metal), so that if you survive until the End Game, you're able to construct a tall and sturdy fortress from which you'll launch your final attacks. To adopt this strategy, you'll want to gather at least 1,500 wood, stone, and/or metal by the time the End Game portion of a match begins. Next, select the type of fortress you want to build. A common strategy is to keep the design simple, but functional. Wait until you know the location of the final circle before building your fortress, and then choose the most strategic location that'll allow you to see your opponents. However, avoid being in the dead-center of the final circle, or you'll become the center of attention, and all remaining players will focus on killing you off first. When constructing your final fortress, make sure the bottom portion is extra sturdy. Consider building the first level or two using metal. Otherwise, an enemy can focus on destroying the bottom level, forcing the entire structure to come crashing down. This will result in you potentially falling to your death. A fortress should also be as tall as possible, giving you a bird's eye view of your enemies and the surrounding area within the final circle. As the End Game portion of a match begins, allow the other players to fight amongst themselves first. Some remaining players will get killed off, and those that remain will then have less resources and ammo. This will give you a tactical advantage once you launch your own attacks. You'll also have time to study your enemies and learn what strategies they use, based on the weapons they appear to have in their respective arsenals. You always know how many players remain in the match. One important responsibility during the End Game, is to keep tabs on the location of all remaining players. You don't want anyone sneaking up on you and being able to launch a successful surprise attack. If you have your back to the edge of the storm, for example, don't assume you're safe. An adversary may enter into the storm to reposition themselves behind you when you're not looking, and then launch a surprise attack by rushing your fort. One of the ways weapons are categorized is based on their rarity. A "legendary" weapon with an orange hue is the most powerful in each weapon category. Throughout a match, you'll use many different types of weapons. Based on what you anticipate your core strategy will be during the End Game, make sure you have the right weapons and loot items on hand, and that you've accumulated plenty of ammo for your key weapons. If you plan to stay within your fortress and launch long-range attacks, you'll definitely need a grenade launcher and/or rocket launcher, as well as a sniper rifle with a scope. The grenade launcher or rocket launcher can be used to destroy enemy fortresses and kill whomever is inside, while a sniper rifle allows you to take head shots from a distance when an enemy peeks out of their own fortress. A Sniper Rifle is very accurate from a distance, but the scope can also be used to spy on opponents from far away. Also, use a rifle's scope to get a close-up view of your opponents and their fortresses from a distance, even if you plan to use another weapon to attack. You may enter into an End Game thinking you'll stay within the confines of your fortress and shoot at enemies from a distance. However, you also need to be prepared if someone opts to rush your fort and move in for a close-range attack. Plus, if an enemy attack successfully destroys your fortress and you survive, you'll want to be able to defend yourself and launch short-range attacks. You might decide to quickly build a ramp in order to reach a higher level, or rush your opponent's fortress with a shotgun and grenades in hand. Throughout a match, it's a common strategy to quickly build a tall ramp, and then shoot down at your opponents from a higher level. Instead of building a single ramp, especially during an End Game, consider building a double ramp, and then quickly jumping back and forth between the two ramps. Build a double-ramp for extra protection and to help hide your exact location from enemies. This approach will make it harder for your enemies to determine your exact location. Plus, if an enemy attempts to shoot the bottom of a ramp to destroy it, you can quickly leap to the other ramp, instead of falling to your death. Yes, this approach requires more resources, but it's often worth it. Especially during the End Game, several skilled gamers may be controlling soldiers on multiple sides of your current location. Instead of engaging all of them at once, try focusing on one enemy at a time, but keep tabs on the locations of everyone else. Built into the game are more than a dozen types of loot that can be used to help you survive. In addition to explosive weapons (like grenades, clingers, and remote explosives), stockpile items that can be used to replenish your health (HP) and shields, especially during the End Game. Finding and holding onto two or three chug jugs, for example, and then using them during the End Game, will replenish your health and shields to 100 percent. This item takes 15 seconds to consume, so make sure you're in a safe and secluded area before using it. A med kit will replenish just your health to 100 percent, but this item takes 10 seconds to consume. Since you only have six slots within your backpack in which to hold a selection of weapons and loot, bring only the most powerful loot items into the End Game, and utilize the other slots for the most powerful weapons you can gather... and don't forget the ammo! The best way to discover strategies that work is to study top-ranked players by watching videos and live streams they participate in. You'll find these, for free, on YouTube and Twitch.tv. Within the Search field of either service, type "Fortnite: Battle Royale" or "Fortnite: Battle Royale Strategies." Once you've discovered the very best strategies to use, the key to becoming an expert player is lots of practice. You need to be able to build, explore, fight, and survive, and handle all required tasks very quickly and with precision.